The vixen was mooching about on the path, when suddenly another pair of eyes appeared further down the garden. When she saw them coming towards her, she turned and ran closer to the house, and crouched down in a defensive posture- the other fox did the same. Neither of them growled or made any noise- then they both went their separate ways. 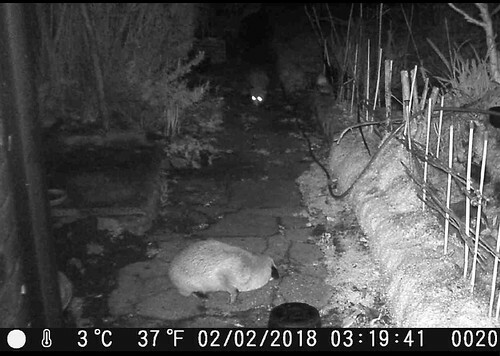 It's interesting seeing the interactions that take place at night... although I've yet to see a fox at the same time as the cat that's always lurking about. Interesting observation. I've seen similar but only very few times. It is, I think, normal behaviour when an unrecognised fox appears. In urban areas I don't know if this is fairly common (because there is a lot of food and therefore potentially a lot of foxes) or quite rare(because there is a lot of food and therefore no need to get involved in what could be a dangerous encounter). When we had a cat, who slept outside almost all of the time, we saw quite a few interactions between her and foxes. She was small (I'd guess not much more than half the weigh of an adult fox) but none of the trail camera videos showed any aggressive encounters. They were often obviously aware of each other but left each other alone - ships that pass in the night, as it were. I don't know if I am correct but I thought both knew a physical encounter was potentially too dangerous, although I feel sure some cats (young or infirm) are taken by by foxes.